When Pigs Fly Pizzeria is a 160-seat restaurant located in Kittery, Maine, featuring a large selection of wood-fired pizzas, appetizer plates, craft beers and draft wines. In addition to the restaurant, this location is also home to the When Pigs Fly Company Store, which offers all of the classic and artisan breads, and other products available from When Pigs Fly. "Great food. Great service. Usually a 10-15 minute wait to be seated. Just enough time to go next door and try a few samples and buy a loaf or two. You get a text when your table is ready!" The When Pigs Fly Company Store in Kittery, Maine is located just next door to the When Pigs Fly Wood-Fired Pizzeria. The Company Store offers all the products of the When Pigs Fly Bakery, which include over 25 varieties of our all natural breads and other products available from When Pigs Fly. Come in and browse, our flavorful ingredient concoctions will surely satisfy any palate -- our sampling table is always available where you can try any and all varieties. 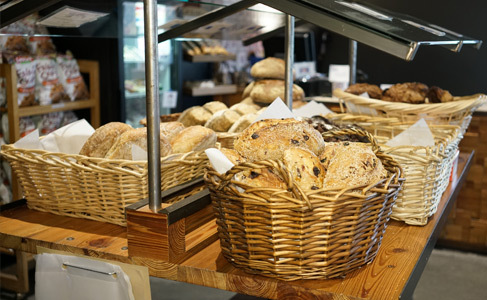 We have lots of specialty breads that are made exclusively for our company stores and farmers' markets. 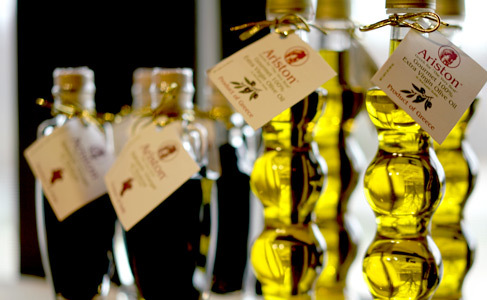 They are made in very small batches using the finest ingredients and will change with the seasons. The hours of the When Pigs Fly Company Store in Kittery are 10:00 AM to 6:00 PM Sunday - Thursday, and 10 AM to 7:30 PM Friday and Saturday - we hope you will stop in and visit! You can also order When Pigs Fly breads and specialty items from our Online Store! "The Phantom Gourmet visits the brand new When Pigs Fly Pizzeria"
A great walk-through from 2011!